I've never really understood why some people find 'bikers'-especially 'biker chicks'-to be so intimidating. I grew up around motorcycles. In fact, one of my very first memories was riding on the back of my father's motorcycle when I was three. If you ask me, it's a great way to get from Point A to Point B in a way that is fast and lets you get outside. However fun riding a 'steel horse' can be, there are still several things you need to know to be able to ride safely and legally. First things first-make sure you have the proper licensing and insurance. In most states, simply having a driver's license for a car isn't enough; you will need to have an additional endorsement to your license to be able to ride a motorcycle. The first step is to take a Motorcycle Safety Foundation course. Visit the MSF's website (http://online2.msf-usa.org/msf/Default.aspx) for more information and to find a class in your area. Traffic laws are different for motorcycles than for cars, so familiarize yourself with the laws in your state. In addition to the licensing, you will also need motorcycle insurance. Many insurance companies also carry motorcycle insurance along with car insurance, so you may be able to get a discount for having both policies with the same company. A motorcycle jacket. I say 'motorcycle jacket' because they are usually made with some extra 'iron' or protective gear you won't find in your average jacket. Plus, there are several that are made especially for keeping you both cool and protected in the summer months. Ear plugs. These things are LOUD! If you are going off road, some extra pads for the neck, chest, knees, elbows and shins. Make sure your motorcycle is properly maintained. 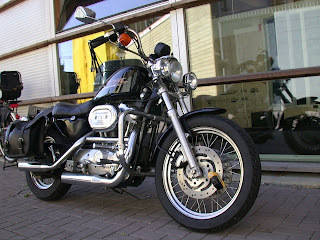 Just like a car, a motorcycle regular maintenance to run smoothly and safely. Motorcycles and their care can get expensive, but a well-maintained cycle can last you for quite some time. Check the oil levels, tires and motorcycle chain regularly. Your MSF course and the store at which you buy your motorcycle will probably give you guidelines for this, but About.com and www.Carlsalter.com can point you toward helpful manuals for your particular make and model. Do not drink and bike! It is never a good idea to operate a motor vehicle while under the influence of alcohol or other drugs! In addition to hurting yourself or someone else, you run the risk of losing your license if you do! If you keep these things in mind, you should get a lot of 'mileage' and fun out of your 'steel horse'. Enjoy! I would love to ride a motorcycle someday! I would rent one to try it if I knew what I was doing. Lol, all the more reason to find a boyfriend, huh? Wearing a helmet should be obvious, but I still see so many people riding without one. It makes me so nervous even to ride near them. I have seen horrible pictures of accidents of people who opted not to wear a helmet and it was the last thing they did. LOL Krinsky you don't need a man for that! Brand, yes, I see people without helmets too, and wonder what they are thinking. Sure, it might be fun to have the wind in your hair, but I can't imagine that would be worth that could happen if you were to have an accident.